Two days a ago e made a little challenge here on DIYP, to try and reverse engineer the lighting on this portrait. A wonderful strobist muscles stretch. I hope you enjoyed it. Thanks for everyone who took a stub at the setup. I did mention that all the lighting on the set was DIY and made by yours truly. The key (1), as many of you guessed was a snooted strobe on camera right, high above the model at f/10. This can be deducted from the hard nose shadow and the higher catch light on the eyes. The actual snoot is a beer cozy with the bottom cut. There were some guesses about a beauty dish, I think a BD would give a softer falloff on the nose. The fill (2), as again many of you indicated, is a 40cm DIY softbox camera left about 2 stops down from main. You can see the square on the second catch light on the left. Actually, If you went super close on the portrait you could see the hotspot in the middle of the square which is common to DIY softboxes which don’t have an internal diffusion screen. The tutorial for building this softbox will go up tomorrow. 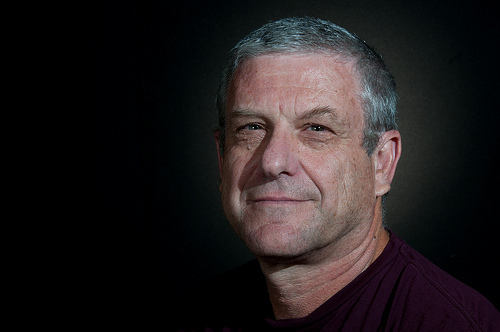 The third (3) light which provided separation is a flash with 1/2 CTO gel and a coroplast gridspot positioned a bit lower than the model’s head and pointing upwards. it is very close to the backdrop and creates a small circle. Many guessed that one as well, but for some reason the gel was hard to pick up. A little bit more fill (5) coming from below is a foamboard reflector covered with aluminum foil. It was placed a little higher on the tripod which is not in the picture. The backdrop (4) is a stretch of black fabric. It is held with a hangman stick-in-a-can and a few A clamps. Lastly, the chair (6) is an $8 stool from IKEA. It is great to see how well a DIY studio can light a portrait, and if you find this to be as much fun as I do, you’d be happy to hear that this image is going to feature is a DIYP studio book coming soon. 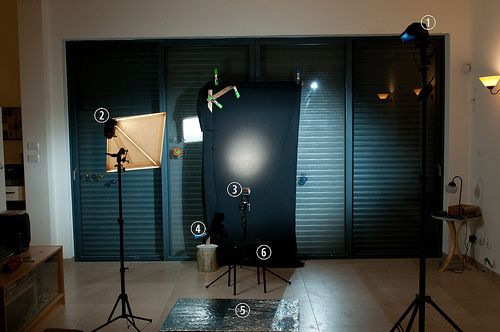 The book features many lighting and studio projects that you can build at home.